Seeing a giant inflatable pool float always brings a smile to my face. It’s something about the combination of a giant object that’s often way too big for the amount of water it floats in that turns me into a kid again. It’s a small effort to bring one of these inflatable floats to the beach, pool or festival(! ), but it’s very rewarding as soon as you blow them to their gigantic size. These are our favorite and most remarkable inflatable floats. 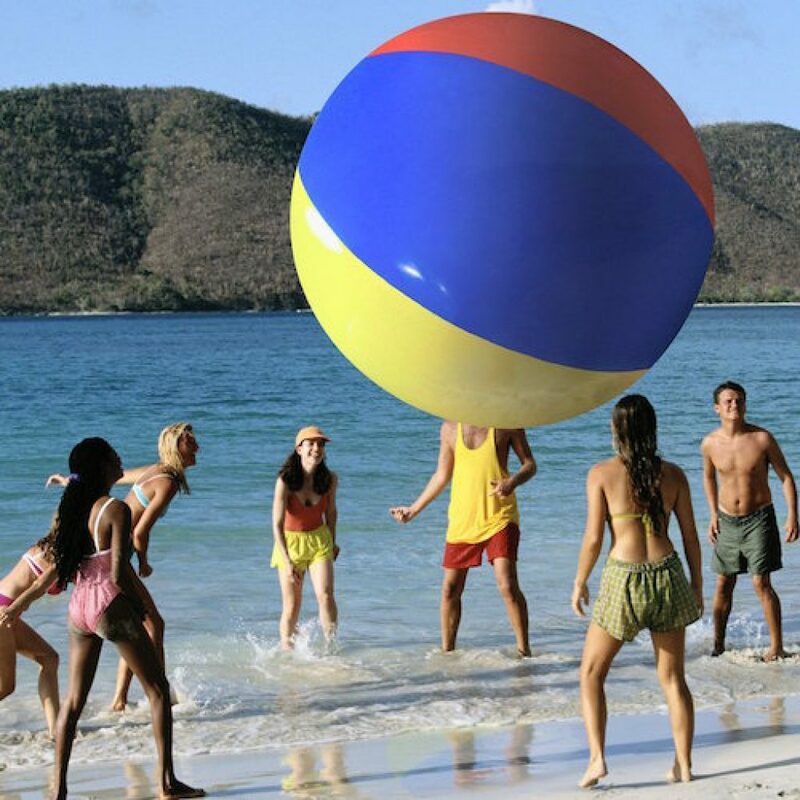 It’s only right to start this best-of list with a classic, giant inflatable beach ball. The Beach Behemoth as this monster is called is the best quality ball of its size. It’s made of durable vinyl and is 12 ft. tall. Perfect for kicking it around the beach. Watch out for little kids though. I always refer people to the following review as it sells this giant beach ball perfectly. Okay, sure it’s not as big a duckie as our cover image, but it’s big enough to be get noticed from a great distance in the pool. If you thought a rubber duck can never be scary this monster inflatable duck might get you to think otherwise. It can fit up to 3 adults or 4 children is very durable and an essential float for your pool party. 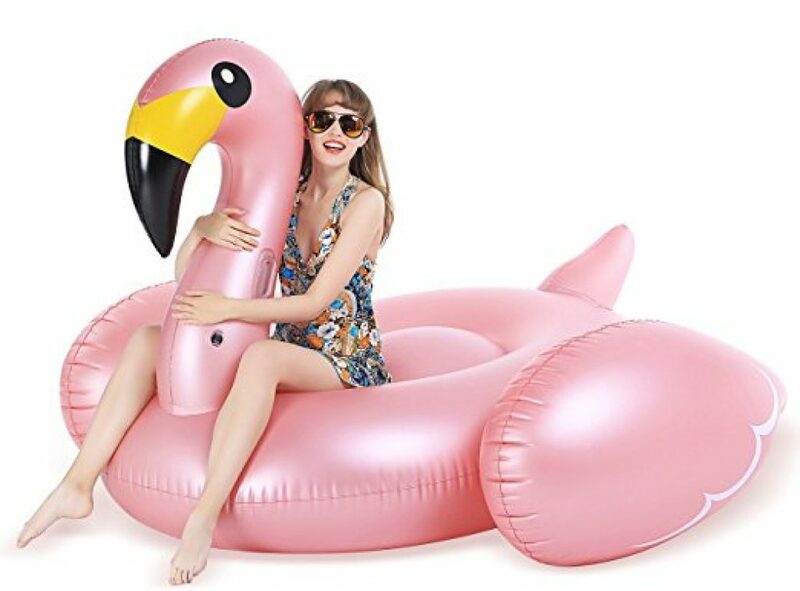 Speaking about pool parties, it wouldn’t be a hip pool party without a giant flamingo floating in your pool. This pink Flamingo by Jasonwell looks very slick with its matt metal finish. Does not include hot girl. What the… If you want to go for a relaxing float without anyone bothering you this giant, inflatable cockroach will do the job. 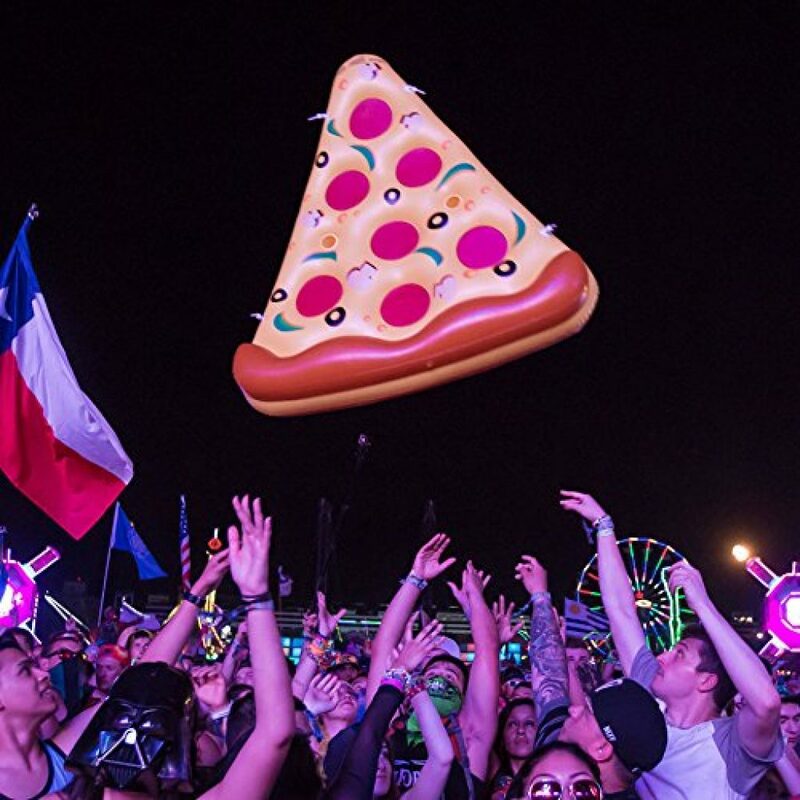 It’s disgustingly giant and makes a perfect novelty float to spicen up the local pool party or festival (Papa Roach? I’ll show myself out). Are you with exactly eight people? Say no more fam. 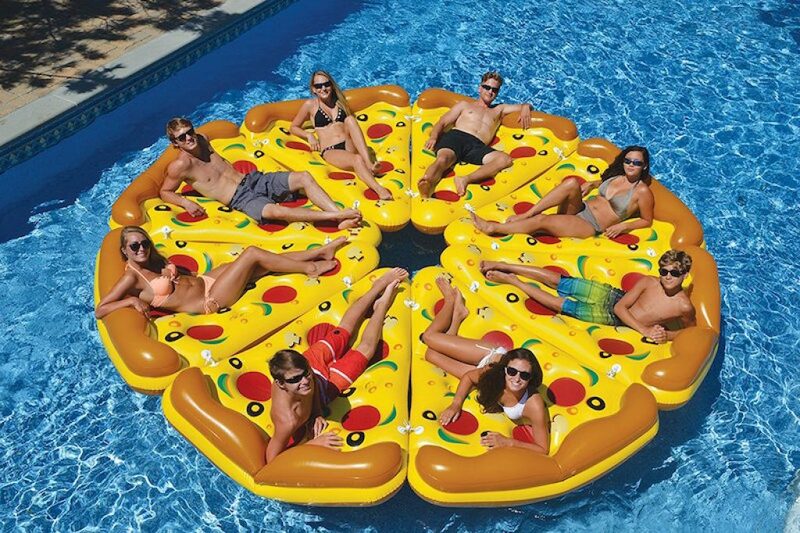 This inflatable pizza slice is an all time favorite pool float. You can lie down on it very comfortably as the crust makes an excellent head pillow. Connectors allow for rafting together 2 or more slices so you can create a full pizza with your friends. We’ve saved the best for last. 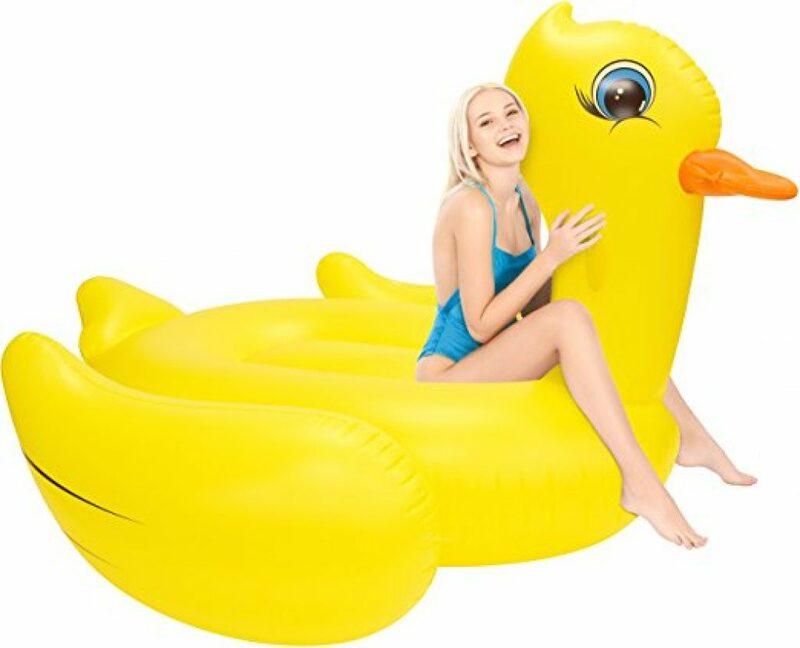 This is the biggest pool float we’ve found online. In fact, this thing won’t even fit your pool. 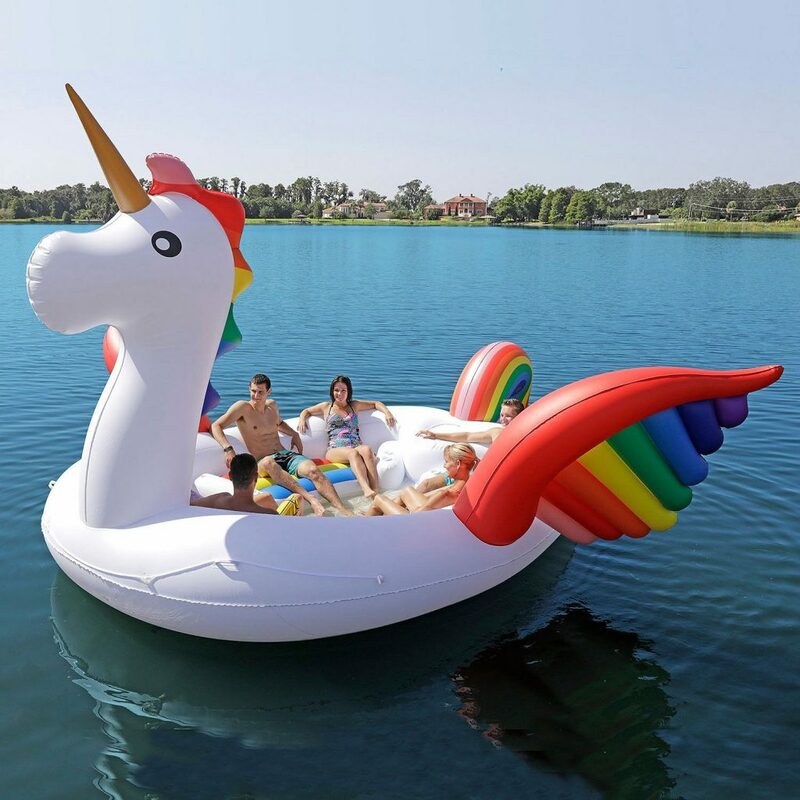 Take this giant unicorn out to the lake and float away to wherever the wind takes you. Like with all inflatable products you might stumble across a product that wears out easily or that loses air after a couple of uses. Don’t sweat it, enjoy these giant inflatable pool floats while you can. Happy floating!